This entry was posted in Geeky, Pittsburgh, Urban by David. Bookmark the permalink. Congratulations on the move to such a glorious city! So nice and hilly and with a great winter. And such great darkness and wonderful architecture. I was going to say that photo shows how the building density has declined in the neighborhood. Given the general trend in postwar years, I’m sure it has, but on second glance the real reason I can’t see as many buildings in the present-day photo is because of all the trees that have grown over the past 80+ years. It almost seems that you can see pavement cracks corresponding to where the old streetcar rails are buried under the pavement, but maybe I’m imagining that. As someone who normally gets around by bicycle, I know you _can_ often see such things, though. The metal rails expand and contract much more so than normal soil, and some of this greater movement gets transferred to the pavement above, eventually cracking it. After learning to recognize it, I’ve noticed that telltale pattern of parallel cracks a certain distance apart on a number of Portland streets. It’s often possible to find a spot where the pavement has completely cracked away to reveal the old rail underneath to confirm the observation. Actually, there is one large building gone, the three-story one on the left. 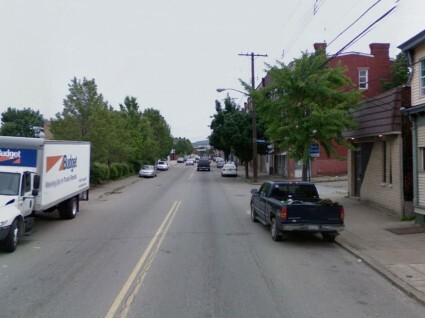 I suspect the billboards in the foreground were just that, though, a row of billboards in front of empty lots. There may never have been buildings in those spaces. That said, building density has declined significantly in almost all of Pittsburgh as the population declined and the people who stayed sort of spread out and got more comfortable. 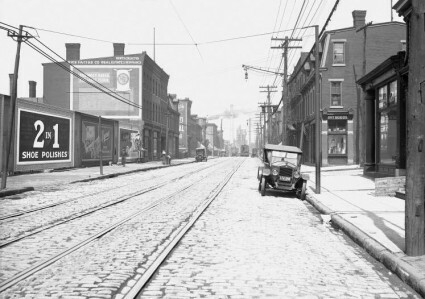 That’s great that the red brick building (in the bkgd off to the right) is still there after nearly 90 years.